Since its launch, the inaugural India International Furniture Fair (IIFF) has gained enthusiastic response from the furniture industry. To be held in Mumbai from 16 to 18 November 2011 at the Bombay Convention and Exhibition Centre, IIFF is positioned as a premier international furniture trade fair which will feature over 70 per cent of international exhibitor participation. IIFF 2011 is organised by MP International Pte Ltd and International Furniture Fair Singapore Pte Ltd.
A special industry briefing on IIFF was recently held in conjunction with the International Furniture Fair Singapore 2011 at Singapore Expo. Participants were briefed with impressive growth statistics on India’s booming economy and burgeoning furniture industry. Ms Sylvia Phua, chief executive officer of MP International Pte Ltd expressed her confidence in IIFF as a dedicated premier platform for international furniture brands to penetrate into India’s massive market. Regional trade associations such as the Singapore Furniture Industries Council, Association of Furniture Manufacturers of India (AFMI) and Institute of Indian Interior Designers have affirmed their support for the trade fair. Mr Anil Mathur, chairman of AFMI, welcomes the launch of IIFF and cites that there has been a lack of international platforms in India for leading international furniture brands to participate in and to showcase quality products to the local market. According to the latest figures from World Furniture Review by CSIL Milano, India currently represents the world’s eighth largest furniture market and its real consumption of furniture will grow another 6 per cent in 2011. India’s rapid urbanisation will spur strong demand for quality furniture in the coming years. Its urban population is likely to rise to 400 million by 2015, with Mumbai set to become the world’s biggest city with a population of 15.7 million, according to Euromonitor International. According to McKinsey Global Institute’s research published last year, India’s fast-growing cities are estimated to drive a near four-fold increase in the country’s per capita income. There is also a rising prominence of the middle-class households with high purchasing power. The organisers of IIFF foresee that the impressive growth prospects of India’s furniture industry will continue to attract more international furniture brands to seek new market opportunities though IIFF. India’s domestic demand is currently dominated by imports from Italy, Germany, Spain and Malaysia. Attracted by the huge business potential India offers, the Vietnam Chamber of Commerce and Industry (VCCI) is the latest organisation to confirm its support for IIFF. A wide range of exhibits, ranging from residential to commercial furniture, occasional furniture and furnishings will be on display at the IIFF. The 10,000 square metre showcase is expected to draw some 5,000 visitors from all over India, Sri Lanka and United Arab Emirates. Besides extensive promotions in Indian subcontinent, attractive show highlights have also been planned. These include a new-to-market product showcase and industry seminars on design trends and new product innovations. 2011 is a new start of China's Five-Year Plan (2011-2015). With a clearer direction of promoting "Green Economy" and "Low Carbon Society", environmental-friendly, trendy and green products are more welcomed by local consumers, especially those high-end users who pursue a better quality of life and lifestyle. In order to have a sustainable growth of China's home fashion, furniture & decoration industry, to facilitate the communication between Northern and Southern Chinese enterprises, as well as to serve the markets surrounding Bohai Sea, China Building Decoration Association (CBDA), China Furniture & Decoration Chamber of Commerce (CFDCC), Dongguan Famous Furniture Association and Guangdong Furniture Chamber of Commerce (GDFCC), firstly join hands with Adsale Exhibition Services Ltd. - the pioneer of international trade fairs organizer in China for over 30 years, to launch China (Beijing) International Exhibition on Furniture, Home Fashion & Decorations 2011 (HFD2011) on Jun 9 -12, 2011 at New China International Exhibition Centre (NCIEC). Authoritative Guests Attend the Press Conference A press conference was held today (Dec 15) at Beijing Radisson Blu Hotel with theme "The Brand New Integrated Home Fashion Trading Platform in Bohai Area". Number of guests from renowned enterprises and associations attended. Ms. Zhang Zhongling, Secretary General of China Building Decoration Association Material Committee, welcomed all the guests attended on behalf of the organizers; Mr. Li Changli, Vice Chairman of China Building Decoration Association, Mr. Zhang Chuanxi, Executive Chairman and Secretary General of China Furniture & Decoration Chamber of Commerce, Ms. Fang Hui, Secretary General of Dongguan Famous Furniture Association, Mr. Jiang Dehui, Executive President and General Secretary of Guangdong Furniture Chamber of Commerce and Mr. Stanley Chu, Chairman of Adsale Exhibition Services Ltd. delivered their speeches on industrial development as well as show highlights respectively. Mr. Li Changli of China Building Decoration Association explained, "Home fashion and building materials industry in China is at the key turning point in its history. It is a new era for innovation and quality-orientation. The production value of China's building and decoration industry exceeds RMB 2 trillion in 2010, more than 14 million people are working in this industry. We utilize our advantages to motivate 20,000 member companies to exhibit and visit HFD2011. Exhibitors can understand more about the needs of customers while visitors can grasp the latest market trend. We believe that the show will attract over 30,000 buyers to come and purchase." "Adsale persists in providing the most professional exhibitions to all industry players. Beijing - the capital of China, is a hub of both traditional culture and the latest fads. With Beijing's evolution towards a "World City" and its stepping up for a cosmopolitan image, its influence on the world's economy, politics and culture that the city imposed is indispensable. Beijing has also set the most fashionable trends for home product consumption in China", said Mr. Chu of Adsale. Spectacular Scale of 600 Exhibitors and 60,000sqm Exhibiting Area HFD2011 is expected to accommodate 600 exhibitors and reach 60,000sqm exhibiting area. 5 theme zones will be set up, namely "Premium Furniture Zone", "Decorative Product Zone", "Kitchen & Bath Zone", "Decorative Material Zone" and "Home Design Zone", so as to facilitate different target visitors including property developers, building constructors, decoration & interior design companies, designers, building design companies, star hotels & restaurants, all design lovers, etc. Organizers also announced that various attractive activities will be held concurrently with hot topics on Trend, Design, Home Fashion, etc. Among all, China Real Estate Association and China Building Materials Circulation Association will organize an activity named "China Home Interior Design Fair - Designers Homes Exhibition". Award-winning designers homes by 30 top Chinese real estate developers will be showcased and visitors can experience the explicitly creative interior design solutions. Mr. Jiang Dehui, Executive President and General Secretary of GDFCC, revealed that the chamber will organize a Guangdong Pavilion at the fairground. This is the first time to gather excellent Guangdong's furniture enterprises altogether and to promote "Guangdong as a brand icon" outside Guangdong Province. Renowned Enterprises Join the Strategic Partnership Signing Ceremony Furthermore, BBMG Group Company Limited, Alliance of Beijing-style Furniture Brands, Beijing New Building Material (Group) Co., Ltd., Hunter Douglas, Guli Security Products Limited, Dongguan YiJia Sofa Co., Ltd., OuDe Furniture, Asia Pacific City of Furniture and Home Materials, etc, have attended the press conference and signed the partnership contract with HFD2011. As renowned enterprises in their own business sectors, they said that Northern China offers unparalleled business opportunities and they believe that the market will grow continuously in coming years. In the past few years, companies could not find one suitable exhibition in Beijing; HFD2011 is really a good platform for them to enlarge the market share in Bohai Area. In the final part of the press conference, all guests held a ceremony to highlight the first cooperation between Northern and Southern Chinese associations. It is expected that HFD2011 will become a stunning show in furniture and decoration industry in China. HFD2011 will be held on Jun 9 -12, 2011 at New China International Exhibition Centre (NCIEC), Beijing, PR China. Apart from 5 authoritative organizers, the show is also co-organized by China Building Decoration Association Material Committee, Beijing Yazhan Exhibition Services Ltd. and GD Modern Convention & Exhibition Management Co. Ltd.
13 well known woodworking and furniture supplier magazines who met in Istanbul by the sponsorship of Intermob 2010 trade fair, founded an organization called FSM (for International Woodworking & Furniture Supplying Magazines) on 17th October 2010. The board consists in five members: Zeki Yücel, Mobilya (Turkey); Luca Rossetti, Xylon (Italy); Richard Barth, Material Technick Mebel (Germany); Carlos Castelo, L'Echo des Bois (Belgium); Eduardo Kiss, Mobile Fornecedores (Brasil). In the first meeting, after the voting process, Zeki Yücel (Turkey) and Luca Rossetti (Italy) are elected respectively president and vice president of FSM association for two years. During the first board meeting held on 18th October in Istanbul (Turkey) and on 21st October in Pordenone (Italy), the board members realized the delegation of authority, and the tasks distribution. At the same time, the roadmap of the association, its own future events, 2011 program and other issues were discussed and fixed. In the declared aims, there are articles related to the creation of a synergy and a systematic solidarity between the magazines aiming woodworking, semi finished products and other furniture supplier industries; the providing of healthy and accurate flow of information between the global markets and the exchanging of articles, reports, news and advertisements. The association accepts only one member magazines from one country and has one formal and one informal meeting every year. The 13 founding members of FSM are: Asora Wood & Technology (Argentina), Supplier Woodworking Magazine (Australia), L'Echo des Bois (Belgium), Mobile Fornecedores (Brazil), Dmt (Bulgaria), Lignum (Chile), El Mueble y la Madera (Colombia), Material Technick Mebel (Germany), Epipleon (Greece), Xylon (Italy), Porte (Mexico), Mobilya (Turkey) and Furniture Technologies (Ukraine). The association has also 12 candidate members who are accepted as members but couldn’t be present in the founding meeting. They are: Holz Kurier (Austria), Wood Industry (Canada), China Wood Industry (China), Puu Tekniikka (Finland), Bois Mag (France), Wood News (India), Drewno Technika (Poland), Intarzia (Romania), Les Prom Inform (Russia), Fdm Asia (Singapore), Woodworking and Furniture Digest (Taiwan), Furniture Production (Uk) and Wood & Wood Products (Usa). China (Beijing) International Exhibition on Furniture, Home Fashion & Decorations (“HFD” thereafter) will be held in New China International Exhibition Centre (NCIEC) from June 9-12, 2011. The exhibition is jointly organized by Adsale Exhibition Services Ltd., China Building Decoration Association, Dongguan Famous Furniture Association and co-organized by China Building Decoration Association Materials Committee, GD Modern Convention & Exhibition Management Co Ltd and Beijing Yazhan Exhibition Services Ltd.
With the rise of the nation’s economic power, Chinese people become wealthier. They no longer simply consider the practical aspect of home living, but look for a living environment that stresses on comfortable space and spiritual enjoyment. It enriches the furniture and home fashion products with more trendy and stylish elements. Beijing, the capital of China, is a business city with both rich cultural heritage and latest trends and fads. Beijing is now transforming into a “World City” and a cosmopolitan image is gradually formed. It does not only exercise great influence on the world’s economic, political and cultural development, but also set the trends for the nation’s home furniture, fashion and decoration products. The World Bank estimates that more than half of the world’s building construction projects will take place in China by 2015. And by 2020, the urban population in China will rise to 60% while residential area will reach a high level of 70 billion square meters. The Chinese people demand a higher home living standard, which means huge business opportunities to home furniture and decoration industry. HFD 2011 is built upon the themes of “home fashion”, ”environmental-friendly” and “low carbon”. Following the trends of “environmental protection”, “ecology”, “fashion & trends”, “health” and “comfort”, it places great focus on energy saving and low emission and aims to build a green and low carbon city. The exhibition showcases world famous brands, self-developed brands, original design brands and quality products to make itself a new and innovative home furniture and decoration industry event. HFD 2011 keeps abreast of the industry trends. It provides one-stop comprehensive home furniture, design and decoration solutions based on the ideas of “low carbon”, “environmental friendly” and “green”. In this way, consumers are able to understand the concept of low carbon living and the put into effect the use of environmental-friendly, low carbon and green home furniture and products in thousands of households. Industry practitioners generally agree that “low carbon living” will be the new highlight in the industry of home furniture, fashion and decorations. To make one-stop sourcing more convenient for buyers, 5 theme zones are set up, namely “Premium Furniture Zone”, “Decorative Product Zone”, “Kitchen & Bath Zone”, “Decorative Material Zone” and “Home Design Zone”. Famous brands in the category of premium furniture, decorative products, whole-set kitchens and related products, sanitary wares, decoration companies, interior design companies, energy-saving and environmental-friendly materials are also invited to make it an important industry function. The exhibition aims at providing the industry practitioners in Beijing and the nearby regions with the latest home furniture products. It has built a new platform for both local and overseas enterprises to develop their import/export businesses. We cordially invite all home furniture experts to meet in Beijing. Furniture Exhibition for the 8th time will be taking place in Shanghai from June 2nd to June 4th 2010 at the Shanghai New International Expo Centre. The total are that this exhibition is going to occupy will be around 65,000 square meters with almost more than 65,000 visitors who will be coming in this fair. It is expected that there will be around 600 exhibitors who will be coming here to display their unique products in front of the visitors thereby developing trading relations. The main organizer for the Furniture Exhibition 2010 will be Shanghai Buying Exhibition Co., Ltd which is China’s one of the most famous organizers. Last year 2009, Furniture Exhibition had attracted around 50082 visitors thereby clearly showing that this year the number of visitors will be increasing by 19% as compared to that of the last year. Includes sitting room furniture, bedroom furniture, soft sofa, cane furniture, dining room furniture, children's furniture, and other furniture. Includes European-style furniture, American-style furniture, antique furniture, antique soft furniture, Chinese-style rosewood furniture and others. Ornamental materials, hardware accessories, wood & plates, and wood ware etc. Mandarin Furniture, Han Rex Furniture and Furnishing, Fermi Artcraft, Relax Furniture, Simple Collections, Deadfalls, Creative Furniture, Mei Li Hua Furniture, Asun Home, Rui I, Bai Yi Furniture, Grand Noble, Yalisi, NR, OuvrTR, T.S. Berry, Huateng, Kaida, Ashi Furniture etc. Companies from Indonesia, Malaysia, Singapore, Turkey etc, will also make their presence felt. Furniture Exhibition 2010 is something which not only the people of Shanghai are looking forward to, but also people across the world. This show is expected to be successful than ever before. Being an excellent trading platform in woodworking industry, the biennial world-class event, The 13th International Exhibition on Woodworking Machinery and Furniture Manufacturing Equipment (WMF2010) and The 13th International Exhibition on Furniture Accessories, Materials and Wood Products (FAM2010), will be held on March 10 to 13, 2010 at the China International Exhibition Centre (CIEC) in Beijing, China. Despite the global economic downturn, the furniture and woodworking industry in China gradually recovers and records an encouraging growth. China is undoubtedly a huge market; Domestic sales for furniture in the first half of 2009 have reached RMB 152.9 billion, with a 10.6% year-on-year growth. Furniture exports in the first half of 2009 remained high at USD 14.1 billion despite a drop of 9.45%. Among all, the decline in China’s wood products import and export trade were less than the national level, trading amount for China’s wood products reached USD 26 billion in the first half of 2009. Second quarter data even showed a more impressive increase rate at 15.05%, when compared to first quarter. Such recovery has reinforced the enterprises’ confidence for the WMF2010 & FAM2010, which in turn has resulted to an overwhelming response in both exhibitors recruitment as well as visitor promotion. Following the success in 2006 and 2008, WMF2010 and FAM2010 continue to be Asia’s Largest Fair for Woodworking Machinery, Furniture Accessories and Materials. WMF2010 & FAM2010 will occupy an exhibition area of 70,000sqm, accommodating 700 exhibitors from 19 countries and regions including Belgium, Finland, France, Germany, the Netherlands, Hong Kong Special Administrative Region, India, Italy, Malaysia, China, Taiwan Province and more. Over 2,000 machines will be presented at the exhibit. The organizers have also expanded the venue from 10 halls to 12 halls to include theme zones on Woodworking Machinery, Panel Board Manufacturing Technology, Furniture Accessories, Materials and Wood Products (Overseas), Furniture Accessories, Materials and Wood Products (Local) and others. Meanwhile, the number of pavilions will be increased to 7 to include those from Germany and Italy, and from associations / regions like Taiwan Association of Machinery Industry (TAMI), Taiwan Woodworking Machinery Association (TWMA), Qingdao Woodworking Machinery, Shanghai Woodworking Machinery and Lunjiao Woodworking Machinery. Numerous renowned woodworking, accessories and materials enterprises have already confirmed / reserved spaces for the event. Lunjiao Woodworking Machinery Pavilion will house Nan Xing, New Mas, Weideli, V-hold, Guangdong Firmy, Tongan, Ente, etc. Qingdao Woodworking Machinery Pavilion will include Friend, Yazhou Gongyou (Weihai), Shanxi Qiulin, Qingdao Yongqiang, Qingdao Haomailong, Qingdao Huashunchang, Qingdao Haozhonghao, Qingdao New-Motivity, Shangdong Dongwei, Laizhou Fulin, Qingdao Qianchuan, Qingdao Huachengtian, etc. Shanghai Woodworking Machinery Pavilion currently partners with Shanghai Yuetong and other renowned exhibitors. Exhibitors from Furniture Accessories, Materials & Wood Products will include Blum and more, while exhibitors from the Woodworking Machinery & Panel Board Manufacturing Technology are namely Guanglong, Jiangsu Jangja, Nantong Guoquan, Dalian Huizhong, Anderson, Beijing Lianzhonglian, Keenman, Sufoma and more. To enhance the brand image of the show, the organizer, Adsale Exhibition Services Ltd. specially designs a new logo for FAM. Incorporating with the original logo of WMF, the show has manifested one-stop purchasing and trading concept of “Machinery + Materials + Accessories” to all visitors. Since its inception in 1986, WMF & FAM have gained wide support from furniture and related industries. The trade fair, recognized as the most established woodworking fair in China, is now in its thirteenth set. As in the past, WMF & FAM is expected to demonstrate the latest woodworking machinery, accessories and tools to professional buyers. Exhibits on machinery and tools will include Wood Processing Machinery, Furniture Manufacturing Machinery, Panel Board Manufacturing Machinery, Knife and Blade, Machinery Accessories, Hand Tools, Grinder, Measuring Equipment, Materials Handling Equipment, etc. Exhibits on the materials will include Logs, Panel Board, Hardware, Semi-finished Wood Products, Chemicals, Decoration Materials and more. Building Construction Products and Interior Decorative Materials and Software will also be displayed in their specific theme zones. WMF & FAM have gained exclusive support from European Federation of Woodworking Machinery Manufacturers (EUMABOIS) for three consecutive years (2008, 2010, and 2012), which further consolidates the show’s international and local support. With diversified and extensive promotion campaigns, organizers have collaborated with various local and overseas trade media, as well as furniture-related professional markets for visitor promotion. Several buyer delegations and associations from the Hebei Province and more have been invited. Over 30,000 visitors from all over China and the world are expected to visit the show. The honorary organizers of WMF and FAM are the State Forestry Administration of P.R. China, China International Exhibition Centre Group Corporation and the China Council for the Promotion of International Trade. The organizers include China National Forestry Machinery Association, Adsale Exhibition Services Ltd., China Forestry Group Corporation and China Building Decoration Association. INDEX, the leading trade interior design show in the Middle East, has announced an exclusive consumer evening on Monday 16 November, from 16.00 - 21.00. Consumers will have access to some of the most influential and cutting edge interior design brands from across the world all gathered in one place. Showcasing everything from luxurious lighting to cutting edge textiles, unusual paints to outdoor furniture and tableware, INDEX is guaranteed to be the perfect place for design lovers to purchase sought after, individual pieces from leading interior brands from around the world including Villeroy & Boch, Alpha Crystal Lighting, Andrew Martin International, Bafco Karndean, Kartell, Flou, Zanotta and Swarovski. align=right width="120" height="108">In addition to being able to snap up some fabulous and unique pieces for the home, consumers will also get an in-depth insight into all the latest interior trends, providing inspiration for them to create the perfect stylish home. Leading interior designers will also be on hand with style advice and providing top tips on interior design. World expert trend forecaster, Victoria Redshaw from Scarlet Opus will provide consumers with an overview of the Spring/Summer 2010 & Autumn/Winter 2010/11 trends, detailing the coming season’s colours, materials and surface patterns, ensuring that they are informed about the latest interior design concepts. The show is also set to include other inspirational features, such as a competition to design the majlis of the future. The first competition of its kind, four leading interior design companies have been selected to design and build their vision of the contemporary majlis using only products available at the show. A symbol of traditional Arabic culture where family and friends gather, the challenge lies in fusing the old with the new. All four designs will be built and showcased at INDEX, with the best being selected and awarded by a panel of industry leaders. Access to the consumer day will cost just 50 AED, with tickets available on the door of the World Trade Centre, for more information or to reserve your ticket visit www.indexexhibition.com. With European markets depressed as a result of the economic crisis, The Office Exhibition 2010 is seeing increasing interest from European office sector companies wanting to capitalise on the huge opportunities that are available in the UAE. The office sector in the UAE continues to grow, and the region is becoming an attractive location for companies to relocate to, with many leading international companies transferring their headquarters to the region as a result of its tax-free environment and advantageous free-zones. The recent drop in high office rent, prompted by the current global economic situation, has also added to the attractiveness of the region, resulting in an increasing number of businesses relocating or opening offices within the GCC. The UAE is predicted to have the highest growth in office space in the region, with a further 6.7 million m2 of new office space planned in 2010 alone. Despite the current global economic downturn, the MENA region is still growing, achieving real GDP growth of 2% for 2009. In particular, the higher education, healthcare and public sectors are set to continue to experience extraordinary growth, with the UAE government committed to spending some US$56 billion on public development projects over the next three years. The Office Exhibition, now in its 9th year, is a premium showcase for the high-end products, technology and services that combine to create outstanding working environments. The exhibition, which is the only event of its kind in the MENA region, will take place at the Dubai World Trade Centre from 9-11 February 2010 and will feature over 350 companies, covering an area of approximately 25,000 m2. The event has evolved into a one-stop-shop for the office industry, and will include everything from the latest in office furniture design to cutting edge technology solutions. Interest in the show from companies outside of the Middle East, in particular from Europe, has increased significantly. In addition to National Pavilions from the UAE, Germany, Portugal, UK, Austria, Sweden, USA, Korea and Turkey, there will be a debut appearance of a Greek Pavilion, and Cyprus has doubled the size of theirs. The Danish Export Association is also, for the first time, working on bringing a grouped participation of up to 12 companies. Given the changing shape of the office, with technology becoming increasingly important, The Office Exhibition 2010 will have an increased focus on this sector, and will provide opportunities for IT companies from across the world to showcase their latest products. The show will also include a visionary Future Office feature, where a number of manufacturers from both furniture and the technology companies will put together a mock-up of their predictions of what the working environment will look like in years to come, addressing also the ergonomic issues. Saudi Arabia's small business sector is among the most optimistic of 12 key emerging markets studied in a new HSBC survey. Small business sentiment across the kingdom was largely positive in their 12 month outlook regarding nvestment in their businesses, foreign trade and recruitment, the Emerging Markets Small Business Confidence Monitor added. The survey showed that 39 percent of Saudi businesses with a turnover of less than $30m expected to increase capital expenditure while only 19 percent believed investment in their companies would slow. The kingdom's entrepreneurs were even more optimistic about trade outlook. About 57 percent believed trade with the rest of the Middle East will expand by up to a fifth or more. 80 percent predicted increased business with mainland China, with more than half of these anticipating growth of more than 20 percent. Two thirds of respondents forecast a rise in trade with the rest of Asia. Regarding recruitment, owners and top management of Saudi Arabia's small businesses have the most ambitious plans of any of the 12 emerging markets surveyed with 40 percent expecting to need to increase their workforces and with one in eight seeking to grow their staff by more than 20 percent. "Overall, the leaders of Saudi Arabia's smaller business sector - the vital fuel of every country's economy - are more positive about the short term outlook than their counterparts in almost all other emerging markets surveyed," said, Adel Al-Nasser, deputy managing director of SABB. Furniture Manufacturing & Supply China 2009 (FMC 2009) and FMC Premium will be held at Shanghai New International Expo Centre from September 9-12, 2009 alongsde Furniture China 2009, the 4th largest furniture exhibition in the world, which is expected to attract 2,300 exhibitors and more than 70,000 domestc and international trade visitors. Strong support from our exhibitors ensure FMC 2009 was fully booked a month before its opening. FMC will host more than 600 exhibitors of woodworking machinery and furniture matereals over 36,000 sqm of exhibition space. The show is proud to attract a large numbe of famous machinery equipment brands, including HOMAG, BIESSE, WEINIG, YUETONG, NANXING, YUANTIAN, many other wel-known Chinese woodworking machinery manufacturers as well as a pavilion organized by the Taiwan Woodworking Machinery Association (TWMA) with more than twenty Taiwanese companies. At the same time, more than 350 domestc furniture matereal suppliers will present a full variety of high-quality products and exhibits, together with well-known international brands like AHEC, JOWAT, ITC, CHENGUANG, FRENCHTIMBER, KINGDECOR etc. Firms like HUARUN coating and BASF will be participating in the show for the first time. Located in hall E5, FMC PREMIUM 2009 will feature 150 selected exhibitors over 6,000 sqm of exhibition space. Exhibits will cover all necessities for furniture manufacturing rom raw materials to chemicals, fittings, semi-finished products and many more. The Organiser is arranging a series of seminars and other activities during the show to foster cooperation between domestc and overseas companies. Organised in cooperation with "China Wood", the "Legal & Sustainable Furniture Raw Mateal Forum" will be held on September 10, 2009. WWF-CFTN, FSC\PEPC, AHEC, Canada Wood and French Timber will come together to discuss timber availability, classification and application in China, and about sustainable development of furniture matereal. FMC 2009 will be a testimony to the rapid development of the country's furniture and interior design industry. This year the show will again bring the most updated products and designs and market deas. INDEX 2009, the leading trade interior design show in the Middle East, has signed an agreement with APID, the Association of Professional Interior Designers, making them the official partner for this year’s show. It marks the first steps towards a combined goal of introducing the Dubai Festival of Interior Design, which would place the Emirate at the forefront of the international interior design calendar. APID is hosting the 24th General Assembly of the IFI (International Federation of Interior Architects/Designers) and the World Interior Design Congress 2009. These biennial events are being held in Dubai for the first time in their 46 year history, and take place from 6-11 November. INDEX takes place the following week, from 14-17 November, at the Dubai World Trade Centre, and is introducing a number of features to help the interior design industry maximise opportunities in what is a difficult business environment. The exhibition will showcase some of the industry’s leading products and designs from high profile companies including Longhi, Rexite, Porada, Andreu World and Colleccion Alexandra. Pre visitor registration for INDEX is already at record levels, up by over 90% from this time last year. In order to bridge the gap between the events, INDEX will be hosting cultural tours for IFI delegates on 12 and 13 November, as well as a reception at the show. In addition, IFI delegates will be invited to join the INDEX VIP Business Match-Making programme, which will match top interior designers, specifiers and buyers with relevant exhibitors. Hosting the Dubai Festival of Interior Design will be a fusion of the best of creative talents and business minds that will undoubtedly place Dubai on a level with other major international design show capitals. The Emirate of Dubai will embrace interior design for the week, promoting interior design as a vital part of Dubai’s economy where significant projects are confirmed for the year 2009. The Dubai Festival of Interior Design will elevate the profile and global understanding of professional interior design and consultancy to a new level, thereby providing significant benefits to both clients and the design profession world wide. APID and INDEX are collaborating closely to ensure that this event will be a landmark in the design calendar and an event at the forefront of “Design Worldwide”, for the future. Lu Buchanan, INDEX event director said, “We have been working closely with the industry to ensure that INDEX 2009 is very design-focused, as we want to produce a show that rivals the other leading international interior design events. Our longer term goal is to expand INDEX so that it becomes part of a brand new Dubai Festival of Interior Design. Working with APID, and other interested parties, will ensure that this happens, and our formal relationship for INDEX 2009 is a great start to this process. CIFF 2009 March, short for 23rd China International Furniture Fair (Guangzhou), lowered its curtain with gratifying results on March 30th at China Import & Export Fair Complex, Guangzhou. The 1st phase of the grand event specialized in CIFF-Home Furniture, staged from March 18th to 21st, concurrently with Outdoor & Leisure Guangzhou 2009, Homedecor & Housewares China 2009, CeramEx China 2009 and Intertextile Guangzhou-Hometextile China 2009, while the 2nd phase focused on CIFF-Office Furniture, along with China International Woodworking Machinery & Furniture Raw Materials Fair (Guangzhou) / interzum guangzhou 2009 from March 27th to 30th. In the face of the global economic crisis, the March show of CIFF 2009 along with seven vertical shows under one roof gained a great success. The total exhibition scale has enlarged to 500,000 SQM and hosted 2620 domestic and overseas exhibitors while gathering 136310 buyers, 32922 of which are overseas buyers from 160 countries and 103388 are domestic buyers, respectively. The overall attendance of buyers remains the same level as that of 2008, with 3.1% growth in domestic visitors and 11.8% decline in overseas counterparts. According to the feedback of our satisfaction survey, exhibitors are fairly pleased with the results which are better than what they anticipate and they have basically achieved the targeted goals. CIFF 2009 March - Home Furniture shows up with an all-star cast. The domestic leading brands like LANDBOND, HING LEE, KINWAI, ROYAL, KUKA, ZUOYOU, RED APPLE, OPAL, KANG SHENG, BEKING，CAMERICH, ZHI HAO, STEEL-LAND, YI FENG, BILTURE display their newest products in Modern Furniture region. FOUR SEAS, BO YUEN, YUE XING, WEN HUA SPIRIT, POSH, GOLD PHOENIX, GAINWELL, FU BANG, WSXINGLONG, MINGQING in Classical Furniture region exemplifies dazzling charm in showcase. Besides, overseas exhibitors including INDEX(Thailand), Colono(Spain), KODA(Singapore), Ashley(America), Jans2en(HK), HI TEAM(Taiwan), PT. BUANA INTER GLOBAL(Indonesia) bring in the furniture of fresh designs. Though the buyers from USA and Europe buy less due to weak markets, exhibitors gain increased trading volume in the domestic market and other rising markets like Middle East. The furniture wholesaling giants of Shunde Louvre and Redstar Macalline have their booth shown at CIFF as well. The fashion concept of “LOHAS”, standing for the idea of healthy life and human friendliness, is expressed in the design of furniture found throughout the fair, which delivers the good experience to the visitors. They also appreciate the services and activities at the CIFF, like the “Service System for Frequent Buyers” first launched this year, the gallery of “Red-Stroke Design Exhibition” promoting cooperation between designers and manufactories, and the Digital Kitchen Zone highlighting the technology in lifestyle. The multifunction of trading and communication at CIFF gains the high intention for next session’s participation from both buyers and exhibitors. Under “VIP Union System”, innovatively launched this year, 105 most influential brands like ALMA CONTRACT, KIAN, MANO LEISURE, GARDENART FURNITURE, ARTIE GARDEN, HUATONG GARDEN and LINYA CRAFTWORK have been attracted to the fair of Outdoor & Leisure Guangzhou 2009. The show establishes a high-end platform for commercial meeting, image presenting and fashion releasing through the full display of outdoor living. Seminar on European Outdoor Furniture Design delivers a hint of making use of high-quality environment-friendly materials to enter the market. The gallery of “World Class Outdoor Design” combines together top-brand display and interactive communication to release the latest outdoor fashion and promote the concept of healthy living. Over 90% buyers are satisfied with the show and will come back next year in the survey. Homedecor & Housewares China 2009 covered an area of 35,000 SQM, 15,000 SQM larger than the previous session in March 2009. Around 200 domestic and overseas enterprises including famous brands like Sitong,Xiang You, Artage, Eternal, Yinbo, Zhongshun Wooden, Jin Da, Landbond, Ya Masun, Fuhua, Beixiong displayed their qualify products at the show.The diversity of product lines cover the products of Pottery & Glassware, Lighting, Picture & Frames displayed at the show which becomes richer than that of the last session. The inspired designers bring in concepts like “Continental Style”, “Miscellaneous Pieces” of Nature, Abstract Art, and Accessories for all to the exhibits. There are 34,834 buyers visit the show, 8,322 of which are international buyers. 82% of them feel satisfied with the effect of participation and find the products meeting their needs. CeramEx China 2009, covering an area of 10,000 SQM, has engaged in household & art ceramics in spite of Hong Kong Pavilion and Chao Zhou Pavilion. Famous brands like Sanhuan, Red Star, Hualian, Liuhua, Shunxiang, and Yongfengyuan exhibit at the show with products from different regions. The stylish features insist on the concept of health, environmental friendliness and green techiques. Hunan Hualian China Industry Co.,LTD. showcases the estimated master piece of the Chairman Mao’s memoral, which is full of collection values and attracts a good flow of visitors at the show. China (Guangzhou) International Trade Fair for Home Textiles 2009(hereinafter refer to as Intertextile Guangzhou- Hometextile China 2009) featured by 151 exhibitors in an exhibition area of 20,000 SQM. It’s the first time that overseas group pavilions from Germany, Britain, Korea and Pakistan participated in the show, while the exhibitors from major domestic manufacturing clusters like Yuhang, Jiaxing, Shaoxing and Haining in Zhejiang province continually attend the show in regional pavilions. The products are much richer with sofa fabrics and leather accounting for 43.9%, upholstery fabrics 23%, curtain fabrics 15.5%, bed linen, blankets and bedding down products, carpets and rugs 17.6%. Seminar-“The trends of 2010 for the interior products market based on observation of developments in Europe” was performed by Kevin Lewis - a famous designer from Britain during the show. The Gallery of “Outstanding Works in Home Textiles 2008” displays the awarded products in last session show. Visitors are crowding into the gallery and appreciating them as pieces of art. Buyers throughout the world pay high involvement to the show and about 80% of whom remarked that they will be back at the next session according to the research. CIFF 2009 March - Office Furniture is the largest office furniture event in Asia with features of new concepts, new designs and new stature. Nearly all top furniture enterprises like MATSU, SAOSWN, OU LIN, YOUZHAN、SUNON, OFISWORLD have participate the show and divided by specified product categories in order under the deeper professional organization. Many famous manufacturers at the fair demonstrate their latest creations and advancements to show their improvement in technological innovation. SUNON firstly releases their latest R&D technique of “U + Coating Technology” during the show, which reveals the new progress in the environmental friendly skill in domestic furniture manufacturing industry. Seminar hosted by SAOSEN Furniture introduces the future development of “medium density fiberboard powder coating technique” to furniture manufacturing. The office furniture show this year adopts the creative multiple formats in activity organization. The theme gallery of “Finland Modern Furniture Design and Office Space-Works of Yrjo Kukkapuro and His Students” is one of the unique activities consisting of three parts: the design works show, the academic forum and the cocktail banquet. Many domestic furniture companies appreciate the works created by the renowned design master and his students and acquire advanced design concepts from Europe through the event. It also functions as a channel for communication in the furniture industry. Besides, the Annual Meeting of China National Furniture Association Office Furniture Profession is held during the show. The 3rd Annual Meeting of Government Furniture Procurement kicks off with officials from over 30 procurement centers of municipal governments and furniture company representatives. The 23rd CIFF-Office Furniture is more than a mere “one-stop” trading platform, but a must attended event of Chinese office furniture industry. Though the industry is in a tough time resulting from the global economic crisis, the industry practitioners still remain confident about the future by the positive responses from the market at CIFF. Zhu Changling, vice president of China National Furniture Association, foresees an increase of exports in the office furniture industry; his foresight is not only justified by investigation done by the organizer of CIFF which indicates that there is a change in sales strategy, but not in volume, but also proved by the marketing director with HONGKAI who also says that there is an increase in the number of buyers both at home and from abroad at this fair indicating a promising future. China International Woodworking Machinery & Raw Materials Fair (Guangzhou)/interzum guangzhou 2009, holding the strategic position as a gateway for international companies to sell to the China market as well as a springboard for China companies to sell to Asia, attracts many repeated as well as first time exhibitors. The fair is further enlarged in size to 80,000sqm, 33% over that of last year, providing more opportunities for participating companies and buyers. In total, 761 exhibitors attend the show, 10.6% more than that of last year, with 209 international exhibitors. Industry players remain optimistic about the future. About 39,222 buyers visit the show, 9,057 of which are overseas buyers, slightly over the situation in last year. Li Qiang from Chengdu, China, says the increasing number of buyers at the fair shows the sign of an optimistic attitude toward the future market. The frequent buyer, Karl R. Kehrer from Australia, is glad to see the great progress in scale and upgraded products and service. Jan Rudzki, the purchasing agent from Sweden, says with excitement and eagerness that products exhibited are great in quantity. A Right Comprehensive “Whole-Home-Decor” showcase with accessories and textiles. Core themes of Modern Furniture and Classical Furniture in CIFF 2009 Sept. along with Homedecor + Hometextile China (Guangzhou) 2009 will be held concurrently. Outdoor & Leisure products theme will be shown in the special zone at the show. The exhibits from interior furnishing to outdoor lifestyle will form the “Whole-Home-Decor” platform continually. CIFF 2009 September’s exhibition venue is located closely by the largest furniture manufactory base of China and Southern Asia, Hong Kong and Taiwan. The marketing channel throughout the world and the thousands of esteemed customers of CIFF will make CIFF 2009 September the Asia’s furnishing sourcing center in fall season. Professional Service Valuates your Participation. The floor plan arrangement will be divided more scientifically; high technology in fair networking will be adopted to upgrade the service systems for buyers, exhibitors and media; more added value activities and seminars will be organized to motivate the long-term development of the furniture industry. More spectacular business of world furniture industry awaits your participation in CIFF 2009 September. See you right in Guangzhou, September 6th-9th, 2009. The ASEAN Furniture Industries Council (AFIC) is once again leading its member countries to further enhance and develop a seamless furniture trade show circuit in the ASEAN region. Six furniture trade shows organised by AFIC member countries Indonesia, Malaysia, the Philippines, Singapore and Thailand will be taking place over 12 days in March 2009. Taking centre stage is the AFIC-supported 26th ASEAN Furniture Show held in conjunction with International Furniture Fair Singapore 2009, where the best of ASEAN furniture elements come together under one roof. To enable exhibitors and visitors to manage their participation and travel plans more productively, AFIC members fine-tuned the show dates of the furniture trade fairs in their countries to bring the start and end dates closer together. The more efficient exhibition calendar allows both exhibitors and buyers to save precious time and expenses while achieving effective results. This will in turn encourage higher participation and create greater visibility for member countries. First on the calendar is the Malaysian International Furniture Fair 2009 (MIFF), which will be held in Kuala Lumpur from 3 to 7 March 2009. This is followed by the Philippine International Furniture Show 2009 (PIFS-Manila Now) and 20th Cebu International Furniture and Furnishings Exhibition (Cebu X) that are taking place in Manila and Cebu in the Philippines. The International Furniture Fair Singapore 2009 held in conjunction with the 26th ASEAN Furniture Show (IFFS/AFS 2009) is the next show on the circuit and will be held from 9 to 12 March 2009. Rounding up the 2009 furniture trade show calendar from 11 to 15 March 2009 are the International Furniture & Craft Fair Indonesia 2009 (IFFINA) in Jakarta and Thailand International Furniture Fair 2009 (TIFF) in Bangkok. Each furniture trade show on the ASEAN circuit possesses unique strengths and identities that differentiate the ASEAN furniture industries from other regions. For example, TIFF is regarded as an important event to spot the latest furniture design trends with exhibits that often display unique contemporary styles infused with distinctive Asia touches. CebuX is also well-known for consistently featuring products of excellent design. Together with PIFS-Manila Now, the Filipino furniture shows present exhibitors with furniture pieces of fine local craftsmanship steeped in cultural traditions, using natural raw materials found in Asia. Similarly, IFFINA provides a complete overview of the Indonesian furniture and craft industry with a large array of quality hand-crafted products at reasonable prices. Besides showcasing a comprehensive selection of furniture and furnishing products, MIFF also hosts an extensive range of hospitality services to make visitors feel at home. Each year, top ASEAN players also come together to display the best of their furniture and furnishing pieces at AFS. As the most established trade fair for the ASEAN furniture industry with 25 successful runs, AFS features the biggest collection of furniture exhibits from ASEAN countries in one location. Held in conjunction with IFFS at the Singapore Expo, AFS has grown to become a prestigious, must-see event featuring design-centric furniture of excellent quality from manufacturers across Asia and around the world. IFFS/AFS 2009 looks set to continue in its role as a successful global trade platform, with over 60,000 pieces of furniture and furnishing products from some 30 countries slated to be on display. To promote the ASEAN furniture trade show circuit, AFIC has also initiated a joint advertising campaign for the five ASEAN furniture tradeshows. Managed by the AFIC Secretariat in Singapore, this campaign is currently running in key furniture trade publications and serves to highlight the locations and dates of the respective shows. The advertisement emphasises the effectiveness of the ASEAN circuit and its ability to meet the sourcing requirements of global furniture trade buyers in a most efficient manner. To offer the global furniture market a bigger, better and more innovative ASEAN show, AFIC will also look to the implementation of effective design and value propositions from member countries. Inside Outside Mega Show is the flagship production of Business India Exhibitions and the only Indian trade show that has expanded its exhibition centers since its inception in 1988. Grown from 25 booth units in 1988 to more than 800 booth units at present, its high profile makes it a favorite with exhibitors, who use it extensively as a launch pad for their new products. The Inside Outside Mega Show (IOMS) is the largest event on interior design, furniture and furnishings, building and construction industries. A recognized platform for national and international exhibitors, the show’s target audience is architects and designers, engineers, govt. contractors, and all who have an appreciation of beautiful personal and professional spaces. Globalization, the current mindset, is seeing a rapid growth in international interest and participation in IOMS. Italy, Japan, Canada, Malaysia Singapore and UAE have regularly participated in the Inside Outside Mega Show - truly an event that helps influence the future of the interior design, furniture and furnishings and building materials industries. Apart from its annual expansion of the schedule to incorporate new cities and new venues, it has been a practice of this organization to add some new element every year to the show to retain interest and freshness. Because the Inside Outside Mega Show is the largest event on interior decoration, furniture, furnishings, building & construction industries, and offers the exhibitor the most advantages, more and more exhibitors show their interest in participating in the show. Exhibitor interaction with professionals of the industry and national exposure of products are the hallmarks of the Inside Outside Mega Show. Singapore Furniture Industries Council (SFIC) has been formally handed the reins of the ASEAN Furniture Industries Council (AFIC) starting 8 November 2008. Taking over from the Philippines, Singapore will act as the Chairman, Secretary General and Secretariat for AFIC from 2008 to 2010. The other member countries of AFIC are Indonesia, Malaysia, Myanmar and Thailand. The Singapore Furniture Industries Council (SFIC) Executive Committee has appointed Mr Jerry Tan as Chairman of AFIC for the two-year term. Mr Tan is the Vice President of SFIC and Managing Director of JACO Singapore Pte Ltd. He is a well known figure in the regional furniture circles and has tremendous experience in the organisation of international furniture trade exhibitions and missions. He has extensive contacts with major furniture players and regional furniture associations throughout the ASEAN countries. His wealth of experience in regional furniture trade issues will put him in good stead to play a key role in fast tracking AFIC’s strategic initiatives to accelerate the growth of the ASEAN furniture industries. To further strengthen the committee’s knowledge and expertise, the SFIC Executive Committee has appointed Mr Steven Chew, Executive Director of Sitra Holdings (International) Limited, as Secretary General of AFIC. Mr Chew has over a decade of experience in the furniture and timber industries. He is also a strong supporter of the green movement and brings with him a wealth of industry experience in sales, purchasing, operations and finance functions. Together with Mr Jerry Tan, he is expected to play a key role in further strengthening AFIC and instilling it with a renewed sense of purpose. “In these challenging economic times, AFIC plays an even more important role, that of ensuring healthy intra-ASEAN trade and an enhanced competitiveness to stay buoyant amidst the sea of fast-moving global players who are increasingly focused on speed and value. ASEAN integration is our primary focus and I hope to see immediate results in the form of a smoother, more cohesive and effective ASEAN furniture exhibition circuit.” adds Mr Jerry Tan. AFIC member countries like Indonesia, Malaysia, the Philippines, Singapore and Thailand hold annual furniture trade fairs, namely International Furniture & Craft Fair Indonesia (IFFINA), Malaysian International Furniture Fair (MIFF), the Philippine International Furniture Show - Manila (PIFS), Cebu International Furniture and Furnishings Exhibition (Cebu X), International Furniture Fair Singapore in conjunction with ASEAN Furniture Show (IFFS/AFS), and Thailand International Furniture Fair (TIFF). The ASEAN Furniture Show held in conjunction with IFFS in Singapore adds to the vibrancy of this circuit, bringing the best of ASEAN players together in a dynamic and comprehensive trade event annually. AFIC will work with member countries to devise a more efficient exhibition timetable and route for exhibitors and buyers alike. This will bring about better efficiency in terms of time and expenses for all exhibitors and visitors, and encourage higher participation and greater visibility for member countries. AFIC is also keen to support effective design and value propositions in a bid to offer the global market a bigger, newer and more innovative ASEAN show. In the next two years, AFIC will continue to roll out initiatives to promote closer relations and cooperation between furniture manufacturing business communities in member countries and regional and international organisations. Actively making recommendations on trade incentives and measures to benefit the ASEAN furniture industries, AFIC aims to further accelerate and harmonise the growth and progress of the furniture and fixture industries regionally with a global consciousness. The thirteenth edition of China Furniture & Woodworks was held from June 12-15 in Dalian, comprising three sectors, the 13th China Int’l Furniture (Summer) Exhibition (China Furniture 13th), the 13th China Int’l Woodworking Machinery (Summer) Exhibition (China Woodworks 13th) and the 13th China Int’l Furniture Components & Raw Material (Summer) Exhibition (China Furniture Supply 13th). China Furniture & Woodworks 2008 featured 521 exhibitors, of which 85 were international.Trade visitors of approximately 40,000 attended the show, including about 3000 international buyers from Japan, Korea, Russia, Europe, North America, South America, Middle East and Southeast Asia. In line with the slogan of Export-orientation, combined with domestic distribution, the 13th China Int’l Furniture (Summer) Exhibition saw a balanced development with variety. Wood furniture still took the leading position, and upholstered furniture increased by a great proportion, panel furniture caught more attention. Rattan, plastic, metal furniture and home furnishings made the show a brilliant total events in furniture manufacture industry. New products and new technology became an eye-catching feature of the 13th China Int’l Furniture (Summer) Exhibition. Nowadays innovation has become a common perspective, which has been witnessed as the most distinctive and obvious prospect of Edition 2008. The multi-purposed sofa bed with collapsible design that Dalian Roman displayed combined artistic and space saving feature. Asian Zakka Hari Rabu did more on innovative design. Its products are fashionable and avant-garde. With Thailand hand-made technology, the products gave a close experience to Northern market a Southeast Asian home furnishing style. Preliminary statistics showed that about 85% exhibitors launched new products at the show, and Chinese furniture manufacturers are on their way to independent innovation. Growing domestic market demand evolves fierce competition. As the government’s macro regulation and control put into force, furniture export faces increasing press. A large group of enterprises majoring in export started to explore domestic market. The leading brand of wood furniture in China, Dalian Hua Feng, displayed various types of panel furniture targeted at domestic consuming market. Long-established export companies like Noda, Jinling, San You also focus their eye on the market at home. Domestic distribution is becoming a central part of Chinese furniture manufacturers’ sale strategy. Platform of Export-to-Japan Stylish Furniture Selection was launched during China Furniture 13th.Over 60 pieces furniture of Japanese style from 30 domestic exhibitors displayed become highlight of the show, attracting about 400 person/times of Japanese visitors. Additionally, Sino-Japanese venture like Okawa, Zengben, KYOWA MOKKO, Yuan Mu, IMADA, etc. also displayed their products at the platform. June 12-15, The 13th China Int’l Furniture Woodworking Machinery (Summer) Exhibition and 13th China Int’l Furniture Components & Raw Material (Summer) Exhibition was held in Dalian Star-Sea Convention &Exhibition Center. According to statistics, nearly 300 woodworking machinery and raw materials enterprises gathered at the show over a total area of 20,000 sqm. During the 4 days’ show time, 20,000 trade visitors attended. Further development of furniture industry calls for high quality woodworking machinery and technology. China Woodworks 13th concurrently held with China Furniture 13th gave domestic and overseas professionals an ideal platform of collecting latest market and technology information. Exhibitors of China Furniture 13th and buyers’ delegations from Russia, U.S.A., Germany, Japan and domestic regions visited the show, and made business talk and purchased related products. International machinery manufacturers like Union Brother, Kumha, Bohler udderholm, Companies from Taiwan including Jianming, Senko, Yicheng, Deyuan, domestic enterprises like V-hold, Jiang Jia, Weideli, Weite Power, Qiantway Machine, etc. brought their latest products and impressed the visitors. Mudanjiang Woodworking Machinery Works Co., Ltd. is majoring in production of four-sides moulder, which is used in manufacture of wood furniture. While Dalian is China’s Solid Wood Furniture Industrial Base, and the company attained rich harvest every time from China Furniture & Woodworks in Dalian. At China Furniture & Woodworks 2008 it launched new type four-side moulder which it developed independently. The machine increases feeding speed from 18-24m/minute to 30m/minute, and the rotational speed of blade carrying axle reaches to 8000 turns /minute from original 6000 turns /minute, which comes up to the advanced world standards and improves production efficiency. The new machine received attention from overseas users of Japan, USA, Russia, etc., and the company also established contacts with quality potential customers. Over 100 furniture components and raw material suppliers exhibited under the same roof at China Furniture Supply 13th. Numerous overseas wood suppliers were part of the show, which came out to be a highlight of the event. The U.S.A. Pavilion organized by Hardwood States Export Group (HSEG) and American Hardwood Export Council (AHEC) was joined by 14 American wood products suppliers. Canada Wood was also present at the show together with several local companies. They brought quality wood material to China. With sound quality and favorite price, North American wood has been accepted by more Chinese users. At the show these suppliers harvested satisfying orders. Moreover, they established business contact with numerous potential customers and attained anticipative result. Dalian is renowned as China’s Solid Wood Furniture Industrial Base, the demand for coating products have been prioritized by the industries of this city. Therefore, manufacturers of coating products around the nation are taking this business opportunity to exhibit in Dalian. According to the statistics, the exhibitors who are producing coating products account for the largest proportion, which is 30%. While leather and hardware products are the followings, which accounts for 25%. As the consumption demands of the consumers are diversified, there will be an increase on demanding upholstered and panel furniture. Therefore the demand for leather and hardware products which can be witnessed as the indispensable part of producing upholstered and panel furniture will definitely be on the increase. Nevertheless there are less manufacturing enterprises of leather and hardware products in Dalian. Therefore, tremendous manufacturing enterprises of leather and hardware products from south part of China are landing on this city for penetrating this big market. They wish to make their reputation and brand known through participation of China Furniture & Woodworks 2008. China Furniture & Woodworks 2008 has been successfully held for thirteen sessions. With 13 years of careful cultivation, it has grown into a mature and professional exhibition. The category of China Furniture & Woodworks will be specifically classified, and the service will also be diversified in the near future. The next edition of China Furniture & Woodworks is scheduled from 05th to 08th of June 2009. With great supports of all exhibitors, FMC2007 (The 13th Furniture Manufacturing & Supply China) has been fully booked out three months before the show opening. A lack of 15,000 sqm makes 200 companies fail to participate in the show this year. As forecasted by the organizer, Year 2007 witnesses another positive growth of FMC, with up to 90% growth in exhibiting space. Active reactions from manufacturers show the prosperity of furniture manufacturing industry in China. Updated data from the organizer – Shanghai CMP Sinoexpo Int’l Exhibitions Co., Ltd. – reveal that FMC2007 will exceed 30,000 sqm in space and have up to 600 companies exhibiting, providing an all-round display of latest products and technology of woodworking machinery, furniture manufacturing raw materials and components. To build up a leading platform for furniture manufacturing industry home and abroad, the organizer spares no efforts to promote FMC through over 100 domestic and international media, and send invitations to 100,000 trade visitors in its huge database cumulated throughout past 15 years, thus better proving the tenet “Base in China, Face to the World” of FMC2007. A total display area up to 220,000 sqm of ‘Furniture China’ currently held together with FMC2007 will have around 1,600 furniture manufacturers participating. Facing directly with these trade visitors around, the convenience of neighboring sourcing provides FMC a strong backing to be successful. Being the largest international furniture show in Asia, Furniture China is a professional event with a variety of display sections, such as residential furniture, office furniture, cabinet furniture, and etc. Its concurrent summit forum – World Furniture Congress will also be on the stage for the first time in Shanghai. Furniture China has become the 4th largest furniture show in the world, after the premier three in Germany, Italy, and the United States. With a 30% annually growth, Furniture China guarantees FMC a perfect exposure opportunities for woodworking machinery manufacturers and furniture material suppliers. In order to easily touching exhibitors of FMC and Furniture China, an online B2B platform, www.furnitureinchina.com, is built up and warmly welcomed since its appearance. Being a new highlight of the expo industry, the website provides visitors convenient indexes of FMC exhibitor list, stand number, exhibiting products, and functions to arrange appointments onsite the show, etc. As a year-round show on website, the B2B platform provides 365 show days online for exhibitors and trade visitors. By the end of May, over 1,500 exhibitors of Furniture China and FMC2007 have registered and submitted their information. Enthusiastic exhibitors and visitors, good business deals and transactions along with innumerable innovations characterized the scene at this year's interzum and ensured a very good mood in the exhibition halls on each day of the fair. "interzum has strengthened and consolidated its position as the leading fair", said Wolfgang Kranz, Executive Director Koelnmesse, in summing up the event. "It is impressive confirmation of the fact that sectors, which act in a uniform and specific approach and help to shape their leading fair with commitment, can also increase their own corporate and entrepreneurial success", the Executive Director went on to say. This was also confirmed by Hubert Schwarz, Chairman of the interzum Advisory Board and Executive Director of Julius Blum GmbH Deutschland: "The great expectations, which we have placed in this interzum, have been completely fulfilled - not only due to the high internationality of the event, but also particularly in relation to the number of German visitors. Overall this interzum has been fantastic." For the first time interzum was held in Koelnmesse's Northern Halls. "Because the new halls, flooded with light and inviting despite their dimensions, along with the Trade Fair Boulevard as the central feeder element between the halls, lend the event a brand new flair", was how one exhibitor praised the ambience and atmosphere at interzum. As far as the visitors were concerned, the new, compact structuring of the fair in particular was very well received. "The routes and distances have become much shorter, ensuring an even more efficient visit to the fair" was the comment from one foreign trade visitor. The shortening to 4 fair days and the event's changed sequence from Wednesday to Saturday were also welcomed. In rented hall space, which has increased by 10%, 1,361 participating companies (rise of 5 percent) from 61 countries presented their innovations in the areas of fittings, surfaces, timber-derived products, natural materials, upholstery materials and machines. Around 75 percent of the exhibitors came from other European countries and overseas. With over 50,000 guests from 137 countries the fair had an extremely international flavour once again in terms of visitors. For the first time there was also a renewed increase in the number of German visitors. "The German furniture industry has made use of its home advantage in order to comprehensively inform itself about the international trends. We see this as confirmation of the leading trade fair concept", said Udo Traeger, Vice-President Furniture, Interior Design & Textiles at Koelnmesse. The numerous trade visitors from Germany and abroad expressed their great satisfaction with the innovativeness shown by the furniture industry's supplying sectors and also their delight at the many intelligent and smart new solutions presented by the manufacturers. "We had an impressive stay at interzum: fantastic flair, attractive and very individual presentations by the exhibitors along with very interesting ideas and proposals for our own ideas pool", said the Marketing Manager of a major German kitchen furniture manufacturer. An exciting contrast to the exhibitors' innovations was provided by the trend shows and lecture forums at the centre of the halls. There experts from the most diverse fields of competence and expertise held discussions on current questions and issues in the sector. The supporting events at interzum also attracted great interest. With the "Tappi Symposium", VHI Innovation Congress and the 11th European Veneer Day, a total of three premieres were held. The fact that interzum is becoming increasingly interesting and attractive for architects was confirmed by the great response to the Interior Architects' Day organized by the North-Rhine Westphalia Chamber of Architects on the 4th day of the fair. Once again this year outstanding innovations in the sector characterized the "interzum award: material innovations and design", organized for the fourth time by Koelnmesse in cooperation with red dot. A total of 51 products were selected as award-winners by the top-ranking members of the jury and presented in a separate special show during interzum. Design is becoming increasingly important in the furniture industry's supplying sectors and goes hand-in-hand with technical innovation and optimum functionality. Greater comfort, convenience and user-friendliness is the main motivating factor in the area of increasingly stylish, chic fittings. Perfected and refined drawer systems optimize storage space and promote tidiness and order down to the last niche, nook and cranny. The soft-operating opening/closing mechanism has become a standard feature. Draws close as if by magic, and even top cupboard units' folding doors feature compressed air systems facilitating opening and closing. Decors impress through their sheer diversity. The trend-setters are decors with a texture-like surface, floral patterns and imaginative motifs. The diversity in the area of veneers is increasing. Even previously neglected or somewhat forgotten types of wood are being increasingly used for the furniture industry - fully in keeping with the trend towards a growing individualism. Light is increasingly becoming a component of good design. In particular the LED light source (Light Emitting Diode) is generating many new impulses in the furniture-making sector and an emotionally appealing room design. The lightweight construction panel - with an interior mostly in cardboard-based honeycomb form - is ready for its market launch. It is extremely stable and light, thus ensuring new furniture formats coupled with the simultaneous responsible and economic use of the resource wood. As far as mattress covers are concerned, breathable, but also dirt-repellent fibres are making increasing inroads. Most mattress covers can be removed and washed. The Export Furniture Exhibition or EFE was successfully held on 4th – 8th March 2007 at the new venue - Stadium Putra, Kompleks Sukan Negara, (National Sports Complex), Bukit Jalil, Kuala Lumpur, Malaysia. EFE opened its third annual exhibition in this new venue with the Minister of Plantation Industry and Commodities, Malaysia Yang Berhormat Datuk Peter Chin Fah Kui as guest-of-honour turning the EFE’s Cube as a gesture of his Ministry efforts in guiding the furniture industry to greater heights. EFE as the stage for a dynamic convergence of industry players and industrious entrepreneurs from the global furniture industry, this year, EFE have recorded a total of 197 booths with 167 exhibitors from Malaysia and 25 foreign exhibitors from foreign countries, namely China, Korea, Taiwan, Hong Kong and etc. And in the five days exhibition, the exhibition had attracted more than 10,000 visitors from 151 countries worldwide. EFE 2007 exhibitors have taken their initiative to decorate their booths. This has created an attractive and very impressive surrounding giving an atmosphere of a truly international fair. The panel of judges comprising of consultant from government agencies and head of school from design colleges moved off to judge the 58 entries in the three categories – Best Booth, Best Product and Innovative Product competition of the EFE 2007. The judges were happy to comment that there were improvements in the overall standard of design in the competition. On product identity, they believe that development really takes a long time and that we must be very committed . Again in EFE 2007, students from colleges are invited to be abreast of the latest furniture design, material, branding and etc. The organizer hopes that the new generation of Malaysia has more and earlier chances to contact with the furniture industry and rise out their interests on the furniture design and manufacturing. EFE, promising to be a thriving hub of trading opportunity activities, this is the time to take advantage of the event from forging strategic business partnerships and chart your route to the global furniture market. The global furniture market awaits you at EFE 2008, the premier and most effective furniture fair in the region today. We look forward to welcoming you again in 2008. IFFS/AFS 2007 achieved an attendance of 17,322 trade visitors from 117 countries at the recent five-day International Furniture Fair Singapore 2007 and 24th ASEAN Furniture Show which ended on 5 March. Once again, the best and varied mix of Asian furniture designs coupled with the participation of high-quality international exhibitors contributed to the success of the event which achieved an estimated USD 240 million of spot orders. Amongst the visitors, there were 66 buying delegations from 17 countries. An additional USD 2.1 billion of follow-on sales are expected as a result of the opportunities secured at the fair. IFFS/AFS 2007 also generated approximately USD 38 million in economic spin-offs for Singapore’s Meetings, Incentives, Conventions and Exhibitions (MICE) and tourism sectors. In terms of the scale of the fair, IFFS/AFS 2007 was the largest in its 24-year history, providing a useful platform for the forging of an unprecedented number of potential global trade partnerships. It hosted a record 510 exhibitors from 28 countries of which, many had increased their exhibition space. This resulted in the show being 10.7 percent bigger than 2006 with 60,000 square metres in gross space (or 39,300 square metres in net space) spread across all six halls at the Singapore Expo. With more than 35,000 pieces of designer furniture and furnishing products on display, IFFS/AFS 2007 offered unparalleled variety and quality buying opportunities. These included the largest collection of Chinese, Filipino, Indonesian, Taiwanese and Vietnamese furniture products, exhibited outside of the respective countries. In addition, IFFS/AFS 2007 provided a breath of fresh air when it came to match-making between designers and manufacturers with a total of 92 first-to-market furniture prototypes by young designers from the region who took part in various design initiatives including the annual Furniture Design Award, FL!P Challenge and the inaugural PLATFORM. Indeed, the size and scope of the fair will be expanded when the IFFS/AFS returns from 1 to 5 March next year. IFFS/AFS 2008 will occupy seven halls at the Singapore Expo, allowing an additional 10,000 square metres of floor space for exhibition. To date, more than 12,000 square metres of exhibition space for the 2008 fair have already been booked by more than 50 companies. The 6th Vietnam International Woodworking Industry Fair 2006 was jointly organized by Ministry of Trade - Vietnam Trade Fair & Advertising National Company, Paper Communication Exhibition Services and Yokers Trade & Marketing Service Co., Ltd. VIETNAMWOOD reaches first milestone with a list of impressive endorsements from prestigious woodworking and furniture related industries. It is supported by EUMABOIS (European Federation of Woodworking Machinery Manufacturers - a federation grouping 12 national associations representing the major European manufacturers of machines and accessories for woodworking), VDMA (German woodworking machinery manufacturers), ACIMALL (Italian woodworking machinery and tools manufacturers association),AFEMMA (Spanish woodworking machinery, tools ,equipment and products manufacturers association),TWMA (Taiwan woodworking machinery association and WMMA (Woodworking machinery manufacturers of America) are accounted, and assisted from Vietnam government officials and local industry associations. It was held from October 19-22, 2006 at a new venue, Phu My Hung International Exhibition centre (PIEC). To continue the success and earning public praise, the scale of the fair was expanded farther this year, and it is expected to be more than 155 exhibitors and 14,000 trade visitors from Vietnam, its neighboring countries and Asia. There were numerous well known world-class leading brands which came from more than 17 countries including Chine, Denmark, Finland, France, Germany, India, Indonesia, Italy, Japan, Malaysia, Singapore, Spain, Switzerland, Taiwan, Thailand, United States, Vietnam and etc., participating and displaying a total number of 430 booths. The theme focused on various woodworking machines, cutters, furniture accessories, and semi-finished products. VIETNAMWOOD is the only one professional exhibition held in Vietnam, it is making its presence felt in Vietnam through a high degree of professionalism and quality of exhibitors. There were also many visitations from industry specialists, and foreign industrial delegates from countries such as Italy, Germany, Spain, United States, China, Taiwan and India. Vietnam is currently on its way to become a leading furniture manufacturing country in Asia. Due to the lack of modern manufacturing technology and skills, the Vietnam international woodworking industry fairs are developed to address this need and anticipation of Vietnam’s furniture industries, bringing benefits to the local woodworking manufacturers through improvement in technology, skills and opportunities to replace outdated machines. OIC Int’l Advertising & Exhibition Co., Ltd.
A total of 551 woodworking manufacturers and furniture raw materials suppliers exhibited at FMC/ZOW, including most of the prominent manufacturers (eg: Homag, Shanghai Chaolun, BIESSE, Weinig, SCM, Fonjin, Anderson,Shoda, LEUCO, Shanghai Lihua, etc.). There was also a group of 30 companies from Taiwan Woodworking Machinery Association (TWMA). 150 well-known international companies took part in ZOW area, such as Hettich, Jowat, Henkel, Doelken, Vicwood, Titus, AHEC etc. ZOW China 2006 was certified by the US Department of Commerce and held a national pavilion initiated by the state of North 14 Carolina. The total number of exhibitors in FURNITURE CHINA was 1,500. A total of 61,290 trade visitors took the opportunity to visit FC and FMC, of which 12,241 were foreign visitors from 144 countries and regions. FMC attracted 23,166 domestic visitors from 33 provinces across China including Hong Kong and Taiwan regions and 1,921 overseas visitors. 11,500 handpicked visitors from decision-maker levels attended ‘ZOW China 2006’ in Shanghai. The development of science and technology of furniture industry in China. Suifenhe Longjiang Shanglian Imp & Exp (Group) Co., Ltd.
WOODBUILD, the 3rd international exhibition of wood in construction and architecture, will hold during April 5-8 2007 in Moscow, Russia. The exhibition is organized by the company M-Expo, one of the leaders of the exhibiting market, which works more than 15 years in this field. Now M-Expo is the partner of the world's largest exhibition on woodworking Ligna + in Russia. WOODBUILD will be held under the auspices of the Ministry of the Industry and Power of the Russian Federation, Federal Agency of Timber industry, the Government of Moscow, Russian Union of Builders and others. The exhibition WOODBUILD is a prestigious exemplary action and unique chance for Russian businessmen, allowing them to gather under one roof and bringing to their attention a full picture of the Russian market of wooden housing construction and wood processing. More than 30 000 business people and professionals from wood processing industry will visit the exhibition in order to maintain and to improve the connection between them. Visitors of WOODBUILD 2007 will find a complete offer of more than 200 significant woodworking companies and material suppliers from 15 countries in 5000 exhibiting space. More than 2 times growth rate of exhibiting space this year shows markedly successful choice of exhibiting sections and terms of holding. The basic exhibition sections are building components and materials from wooden glued bearing constructions and cylindered logs using in quick-erected frame and wide-span construction, small architectural forms, interiors, design, furnish, furniture, means for wood protection, machine tools, technological lines, equipment and tools for wooden housing construction, ecology and others. WOODBUILD 2007 will be a premiere in achievement of the national project ”Accessible and comfortable habitation for citizens of Russia”. A conference devoted to exchange of experience of different Russian regions in achievement of the project will form a basis of business program in the context of the exhibition. Another important part of the business program is a conference in utilization of wood waste in the context of effective using of forest density in the world. The conference will show new technologies in getting thermal energy and its ways of widely adopting. Significant part of the exhibition is an exposition ‘’New village" where new technologies in timber housing construction are presented. The best Russian and foreign companies will present various architecturally-building systems from manufacture of houses from massive wood – constructional glued bars and cylindered logs, panel wooden and frame wooden housing construction. Visitors of the exhibition will see houses for constant residing at all geographical zones of Russia, and also small summer houses without warming, baths, wells. Enlivened investment activities in timber industry will increase needs of new equipment for effective wood processing. Equipment as an important section of the exhibition will attract much interest from Russian regional authorities and businessmen. Further information of WOODBUILD is available at the website www.woodbuild.ru. You are welcome to take part in the international specialized exhibition of wood in construction and architecture WOODBUILD 2007. The countdown has started. Only a few weeks to go before ZOW – the exhibition for suppliers to the furniture industry and interior design sector opens for the second time in Shanghai. Held at the SNIEC from September 11-14, 2006, and running parallel with "Furniture China", ZOW will be the venue for a wealth of supplier innovations to create the furniture of tomorrow. More than 150 exhibitors have registered so far for this unique show and more than 12,000 trade visitors are expected. "Chinese furniture manufacturers are looking forward to the second ZOW in Shanghai with excitement," reports Bernd Rademacher, Managing Director of event organizer, Survey Asia Marketing + Consulting. The show is an important platform for the Chinese and Far East markets. tors alike. The focus is purely on the products on show and the interface between and visitors, rather than the acres of displays that often come with international exhibitions. Discoveexhibitors ring product innovations in a creative workshop environment, establishing and developing contacts, getting to know and conquering new markets - these are the factors that carry ZOW, whether in Shanghai or elsewhere. In the biggest furniture markets in the world - Germany, Italy, Spain, Russia and China - ZOW is aimed at furniture manufacturers at each location. Staged wherever it can target a concentration of businesses in the furniture industry, ZOW enables regional as well as international players in the supply sector to reach their respective sales markets. In China alone, there are more than 50,000 furniture manufacturers, the majority of whom will be exhibiting at "Furniture China" and will use the opportunity to visit ZOW. Stefan Jager, General Manager of Shanghai Fennel, confirms, "For us, ZOW in Shanghai is a major gateway to Asia's growth markets." That includes China, of course, but also Hong Kong, Taiwan, Thailand, Malaysia and more recently Vietnam. And India's mass market certainly has its own special role to play here. With an annual economic growth rate of 10%, China is one of the fastest growing markets in the world. This country is home to 1.3 billion people, with per capita income expected to double by 2010. The construction boom continues unabated: currently 80 per cent of public funds are directed into the construction of houses and apartments, and by 2015, around 20 million people per year will be moving into new accommodation. And the situation with regards to other Asian growth markets is similarly positive. Even though rates of economic growth have not quite reached the level experienced in China, nevertheless these countries are also seeing the development of a free-spending middle class, attracted to top quality products. A progressive policy of economic liberalization and the opening of markets to foreign investors are the factors which have created these favorable conditions. 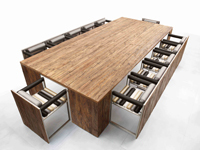 Overall, the Asian market offers excellent sales opportunities for the international furniture supply industry. But it's essential to find the right way in. In this context, ZOW in Shanghai serves as an exhibition and information platform, which not only highlights the current design trends within the industry but is also able to contribute in the search for the right business partners. It's the show event that you can't afford to miss! The 6th Vietnam International Woodworking Industry Fair 2006 is jointly organized by Ministry of Trade - Vietnam Trade Fair & Advertising National Company, Paper Communication Exhibition Services and Yorkers Trade & Marketing Service Co., Ltd.
VIETNAMWOOD reaches first milestone with a list of impressive endorsements from prestigious woodworking and furniture related industries. It is supported by EUMABOIS (European Federation of Woodworking Machinery Manufacturers - a Federation grouping 12 national Associations representing the major European Manufacturers of machines and accessories for woodworking), VDMA (Fachverband Holzbearbeitungsmaschinen),ACIMALL (Italian Woodworking Machinery and Tools Manufacturers’ Association), TWMA (Taiwan Woodworking Machinery Association and WMMA (Woodworking Machinery Manufacturers of America are accounted. and assisted from Vietnam government officials and local industry associations. It will be held from October 19-22 2006 and at a new venue: Phu My Hung International Exhibition Centre (PIEC). To continue the success and earning public praise, the scale of the fair will be expanded farther this year, and it is expected to be more than 155 exhibitors and 14,000 trade visitors from Vietnam, its neighbouring countries and Asia. There will be numerous well known world-class leading brands which come from more than 21 countries including China, Denmark, Finland, France, Germany, India, Indonesia, Italy, Japan, Malaysia, Singapore, Spain, Switzerland, Taiwan, Thailand, United States, Vietnam and etc…, participating and displaying a total number of 400 booths. The theme focused on various woodworking machines, cutters, furniture accessories, and semi-finished products. In addition, it is making its presence felt in Vietnam through a high degree of professionalism and quality of exhibitors. There will be many visitations from industry specialists, which is different from other woodworking fairs. The fair has received assistance from Vietnam government officials and local industry associations, and will be visited by foreign industrial delegates from countries such as Italy, Germany, United States, China, Taiwan and India. Vietnam is currently on its way to become a leading furniture manufacturing country in Asia. Due to the lack of modern manufacturing technology and skills, the Vietnam International Woodworking Industry Fairs are developed to address this need and anticipation of Vietnam's furniture industries, bringing benefits to the local woodworking manufacturers through improvement in technology, skills and opportunities to replace outdated machines. The Furniture Manufacturing & Supply China (FMC 2006) will be held from 11-14 September 2006 in Shanghai New International Expo Centre, coinciding with the Furniture China and ZOW China show. FMC 2006, collocated with four furniture related exhibitions is part of the mega event Furniture China, which this year is reaching out for a total exhibition area of 220,000 sqm with 1,500 exhibitors from some 132 countries. These exhibitors include some of the biggest furniture manufacturers from China, Germany, U.S.A., Singapore, Taiwan, etc. Exhibitors of FMC do not only benefit from a targeted visitor promotion, bringing in excellent business but also from FMC’s proximity to hundreds of exhibiting furniture manufactures. Up to date a numerous range of renown companies have committed to participate, including HOMAG, BIESSE, WEINIG, SCM, FONJIN, ANDERSON, SHODA, Shanghai LIHUA, Shanghai WeiLong, and many more. The Taiwan woodworking Machinery Association will again be present with a distinctive pavilion hosting 30 member companies. Response for FMC 2006 has been excellent so far with bookings exceeding the organizers expectations. Anyone who is familiar with ZOW knows that the show is one of the major events for the furniture industry and supplies to the industry worldwide. In only a few years, the show has built up an enviable international reputation at venues in Germany, Italy, Spain, Russia – and now – China. The 2006 edition of ZOW China is certified by the US Department of Commerce and will hold a national pavilion organized together with the state of North Carolina. There are more than 50,000 furniture manufacturers in China, and ZOW is the ideal platform to gain a foothold in this quickly expanding Chinese market. Many visitors to Furniture China will take advantage of the opportunity to visit ZOW to see the latest innovative finishes, fittings, lighting and niche systems, edging, profiles, furniture shutters and drawers, materials, upholstery, and more. ZOW not only highlights the latest design trends for furniture fittings, but can help broaden thinking about the development of new products – all of which can give your company a competitive advantage. Purveyors of high quality, handmade mosaic flooring Mosaic Orient has become the first Lebanese specialist to recognize Flooring Russia as the best route to one of the world's fastest growing markets. The company, which boasts German supermodel, Claudia Schiffer as one of its high profile clients, has selected the specialist trade show above other general events, with the aim of securing partnerships with retailers and distributors to gain a foothold with top-end clientele. Another new country taking a stand at the show is Vietnamese exhibitor the 'Bamboo Factory' based in Hai Duong City and part of the Apple Tree group. Dedicated to production of bamboo parquet, the Bamboo Factory joins a host of other international manufacturers and suppliers from Italy, Finland, Belgium, Turkey, China, India and the UK. US companies Iook to be back in force at Flooring Russia 2006 too with New Jersey based, NC Carpeting Bindings committed and others at final stages of agreement. Organizers expect ABIROCHAS, one of Brazils largest and most prestige's associations dealing in The Dimensions Stone Industry, to confirm a big Brazilian national pavilion next month. Stones on display at the exhibition will include granites, marbles and calcareous rocks, quartzites, argillaceous rocks, slates, soapstone and talc-stones, all of which are some of the highest quality natural stones available to the market. FMC, incorporating Furniture China 2006 and ZOW at Shanghai New International Expo Center (SNIEC), will be a celebrated export oriented platform for China furniture manufacturing industry. Encouraged by booming China furniture industry, FMC has experienced remarkable growth in recent two years and remains its momentum in 2006. With the record of 20,600-sqm-show space and over 340 exhibitors in 2005, FMC 2006 expects 30% expansion in show space over last year. As the only woodworking machinery and supply show organized by China National Furniture Association (CNFA), FMC preview can reach over 20,000 CNFA members nation wide. There are many provincial woodworking associations cooperate with FMC including Qingdao Woodworking Machinery Association, Taiwan Woodworking Machinery Association, etc. FMC also ties knot with overseas associations in the industry. In 2005, FMC received a visit from a group of representatives from ACIMALL (Italian Woodworking Machinery and Tool Manufacturers Association) for the first time. Success of ZOW China triggers the development of FMC. latest world trends, but also draws a great number of high quality overseas visitors to FMC. In 2005, overseas visitors registered at FMC grew up to over 8,000, compared only hundreds in 2004. In 2006, ZOW has short space to accommodate more and more exhibitors. Furniture China, as one of the biggest export-oriented pl atform, is embracing an expansion this year featuring 220,000 sqm of total space, over 2,000 exhibitors and 70,000 visitors. The inauguration of Kitchen & Cabinet China fair at Furniture China 2006 will be a new attraction to the industry. All exhibitors of FMC will not only benefit from the extensive promotion campaigns of Furniture China, but also will find their clients among the ever-growing exhibitors of Furniture China. With a strong line-up of debutantes and loyal repeat exhibitors, the International Furniture Fair Singapore 2006, held in conjunction with the 23rd ASEAN Furniture Show (IFFS/AFS 2006), has the furniture industry buzzing with anticipation, as the world’s major furniture industry players get ready for this annual, iconic show. To be held from 1st to 5th March 2006, IFFS/AFS 2006 is set to occupy 60,000 sqm of gross space at the Singapore Expo, making it arguably the largest, annual, trade show in Singapore, and a premier export platform for the furniture industry of the world. Organised by the International Furniture Fair Singapore Pte Ltd, about 480 exhibitors from some 30 countries will be proudly displaying more than 32,000 furniture and furnishing products to international visitors from all over the world. China, Hong Kong, Singapore, Indonesia, Taiwan, Vietnam, the Philippines, the United States, Turkey, and Malaysia are among the top exhibiting countries, occupying a combined gross space exceeding 40,000 sqm. Indeed, the IFFS/AFS has the largest collection of quality Indonesian, Vietnamese, Taiwanese, Filipino, and Chinese furniture exhibitors, outside of these respective countries. Other prominent players from Australia, New Zealand, Sri Lanka, Mexico, Myanmar, Japan, Belgium, France, Germany, India, Ireland, Italy, Korea, The Netherlands, Thailand, and United Kingdom will spice up the show’s variety and vibrancy. Also expected to join the excitement will be exhibitors from other European and Scandinavian countries. The unparalleled offerings at IFFS/AFS 2006 include the art nouveau, antique reproduction, baroque, modern, neo-classical, contemporary, European, oriental, renaissance, retro, rustic, Scandinavian and zen furniture classes. Buyers can also browse through the wide selections from the ever-popular Soft Furnishings and Home Accessories section of the show. The IFFS/AFS is also well-known for its distinct focus on furniture design, reflected through its array of design-related features and activities. These features and activities include the Furniture Design Award 2006, Design Gallery, International Furniture Design Forum, the FLIP! Challenge, and the Best Exhibit Award. The International Furniture Fair Singapore, held in conjunction with the ASEAN Furniture Show (IFFS/AFS), began in 1981 and has since grown to be regarded by industry experts as Asia's most prestigious furniture trade show. IFFS/AFS provides an effective marketing platform for regional companies to venture into global markets. As a testimony to the quality of the show, IFFS/AFS is the first Asian-based international furniture fair to be accepted as a member of the elite Union des Foires Internationales, a Paris-based international authority on trade fairs. In addition, it is the only furniture trade event in Singapore to be awarded the 'Approved International Fair' status by the Singapore Tourism Board. The Singapore Exhibition and Convention Bureau also recognises the fair as a major exhibition event on Singapore's international exhibition calendar. With the furniture industry acting as a key driver of Thailand’s economy, the Thai Furniture Association, all related associations and their affiliated members have come together to initiate a brand new furniture exhibition – International Furniture & Designs Objects 2005 (IFD 2005) to be held in Thailand at the end of the year. International Furniture & Design Objects 2005 will be Thailand’s first and original exhibition of world-class creations of furniture, houseware and design objects. The show will be held at IMPACT, Muang Thong Thani, Thailand, from 18 – 23 October 2005. The first three days of the event will cater to trade visitors throughout the ASEAN region while the remaining three days will cater to public buyers. An estimated figure of 10,000 visitors is expected at the show, of which 10,000 are estimated to be trade and 90,000 public buyers. Upon the associations’ strong intentions to bring about a world-class furniture event, this exhibition aims to be unique and outstanding. Under “The Best of Thailand” theme, only the “best-of-the-best” masterpieces will be showcased by the most comprehensive participation from top-class exhibitors. Exhibit profiles include design furniture, kitchen and dining furniture, outdoor furniture, youth furniture, office furniture and systems, design objects and indoor/outdoor decorations. Even though it is making its debut, the Challenger 3, IMPACT’s newest and trendiest exhibition hall, covering an area of 20,000 square meters, is expected to be fully occupied. In fact, over 40% of the total space was booked within the first two weeks of sales opening. It is also an aim of the show to attain regional position in ASEAN in the next few editions of the show. The fullest cooperation from almost all related associations and the professional management by Thailand’s forefront show organiser, Reed Tradex Company, will be felt at the event. Such great cooperation among the associations and heavy participation from the exhibitors truly reflect a bright long future of Thailand’s furniture industry. Best viewed by Microsoft Internet Explorer 6, at 800 by 600 resolution, copyright © furniture.co.in 2005 All rights reserved.